This post contains affiliate links, which means that if you purchase an item through a link, I will receive a small commission. This helps me to fund my blog so that I can continue to provide you with free content. You guys, I tried to skip the whole elf thing, but when I realized that my kids were the only ones in their classes that didn’t have an elf, I decided to jump on the bandwagon. Even though I knew I was going to do an elf, I knew it wasn’t going to be the Elf on the Shelf. There are some thing I like about that guy and some things I really don’t. I like that it adds to the fun and wonderment of Christmas. I also love seeing my friends post all the fun hi-jinx their elves get into overnight-taking baths in a sink full of marshmallow, fishing for Goldfish crackers, or just hanging out with Barbie in the Dreamhouse. The things I don’t like? All the hi-jinx the elves get into. Honestly, I know me. I can barely remember to be the tooth fairy without 18 reminders on my phone. I know I’ll forget to move the little guy and I know I’ll never be organized enough to actually have him do fun stuff at night. The other thing I don’t like? I think the deal is that he watches us and our behavior and reports back to Santa. Just a little on the creepy side for me. So I’ll enjoy Elf on the Shelf from afar as I check out my Facebook feed to see what my friends’ mischievous elves are up to. So I headed to Target and picked up these two adorable guys! They were only a few bucks each, way cheaper than the Elf on the Shelf. I decided to call them Advent Elves and figured they would help us get ready for Christmas in some way. Originally, I planned on doing what my friend Lauren Eberspacher at From Blacktop to Dirt Road does: Kindness Elves. Her elves do a lot of really neat stuff like have the kids donate toys, make Christmas cards for neighbors, and pay for the person’s coffee order behind them. These are all lovely ideas and she’s got a whole months’ worth of them. But Lauren is a special kind of person who is made up entirely of sugar, spice, and Christmas spirit. I have less of these ingredients. I knew I had to set the bar lower. I decided our elves would be Advent Elves and all they would have to do is hide every day with the Jesse Tree ornament. The Jesse Tree is a tradition we started last year. Every day you read a passage from the Bible and hang a corresponding ornament on a small tree. There is a story for each day of Advent leading the kids through the Bible starting with Adam and Eve and ending with Jesus’ birth. The book we use is called “The Advent Jesse Tree.” It tells you all about the history of the Jesse Tree and explains how to use the book. There are two devotions for each day, one for children and one for adults so you can use this book for years to come. I also bought a set of Jesse Tree ornaments to go with the book, but you could easily make the ornaments yourself or with your kiddos. There are plenty of tutorials online. Our elves come on the first Sunday of Advent with a little note telling the kids they will be hiding each morning with the ornament of the day. 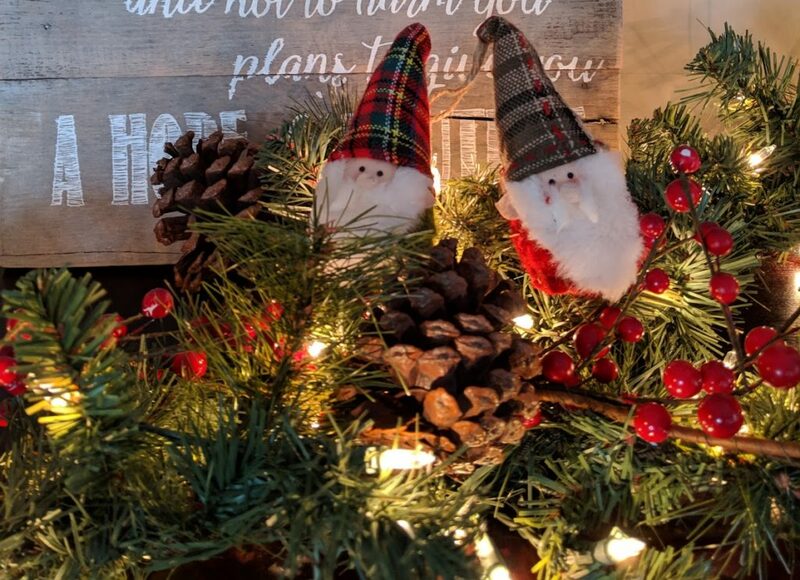 The kids love to look around to find the elves when they find them they get excited to see the ornament and try to figure out what Bible story we’ll read after dinner. Easy for lazy me? Check! 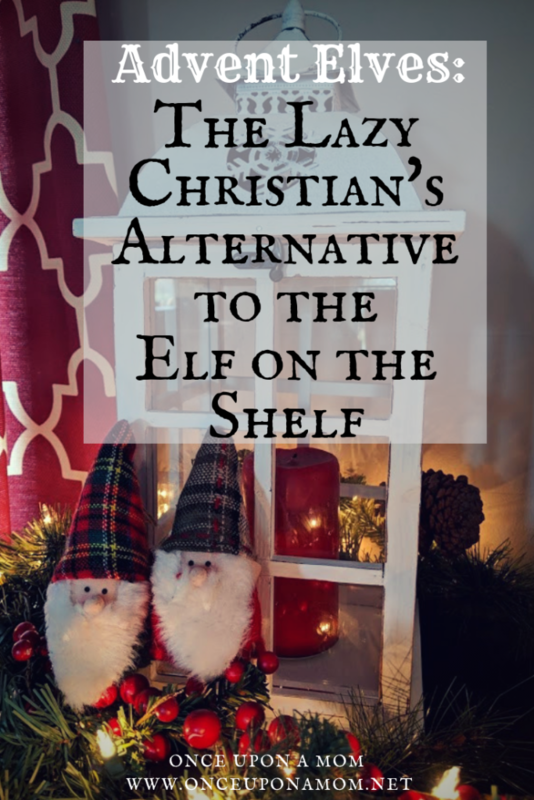 Are you already using an alternative to the Elf on the Shelf? If so, I’d love to hear about it in the comments.